Good news, Android users: Dropbox, the widely acclaimed (and super-useful) file syncing service, is going to be releasing an application for Android devices very soon. Today, they’re giving us a taste of what to expect when the app lands some time in the next couple months, and it looks like it will be worth the wait. The new Android App will allow users to view their files from their phones, and will support multimedia content like music and movies (you can elect to store your key documents locally on your phone if you want). As with the desktop version of the app, if you edit a file, it will automatically sync up with your account. You can upload new files to your account and share links to them with your friends (the app will also be integrated into Android’s systemwide ‘Share Via’ menu, so you can immediately upload a photo or video you shoot to Dropbox) . 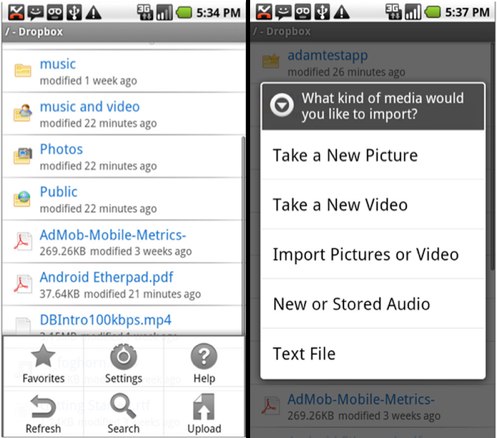 In short, this is exactly what Android-toting Dropbox users have been waiting for. 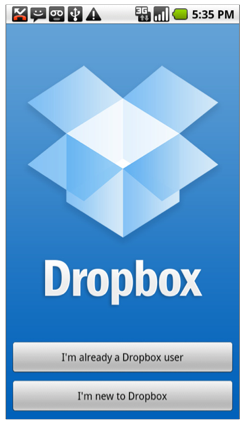 Dropbox has been available on the desktop and web since it launched at TechCrunch50 2008, and it released an iPhone application in September 2009. Other smartphone users have been able to access their accounts through a mobile web app, but it doesn’t offer nearly the flexibility that the native app will. According to an email the company sent out last month, a native BlackBerry app is on the way as well. For those of you that haven’t tried Dropbox, it’s a service that makes it remarkably easy to share files between multiple computers (it means you don’t have to keep emailing files between your home and work computers, or rely on a clunky USB stick). It’s also great for collaboration — we’ve been using it around the TechCrunch office to share files for years now.